RESOLUTIONS that last about four days, diets, detox, exercise plans, gym membership. Yeah, yeah, New Year, New You and all that. We can scoff, and resolve not to make them, but I bet you’ve thought “I’ll start that in the New Year. . .” at least once in recent weeks. My regular, but short-lived, January plans include eating less, shouting at the kids less, spending less, getting less irritated about stupid little things and exercising more and being more organised. It doesn’t last. I know it won’t this time either but it won’t stop me. After all, finding fewer things to feel guilty about doesn’t ever seem to enter my head when January comes around. Happy New Year fellow resolvers! May your bodies be healthy and your minds be free of guilt in 2012. Or until February, at least. Christmas veg from the allotment? Snow chance. Yes, yes, laugh at me if you will. I went to the allotment for the first time in, well, a long while today. Somehow, stupidly, I’d retained that elusive dream of the gardener that I could have vegetables I’d grown for Christmas dinner. The spuds ran out a while ago (the ones I’d got around to digging up) and there are about six garlic bulbs left and a string of onions. However, still in the ground, having had the alleged flavour-enhancing frost on them, sit several rows of fat leeks and a special row of parsnips, just for me (because no-one else will eat them). Of course, trying to dig them up was impossible. 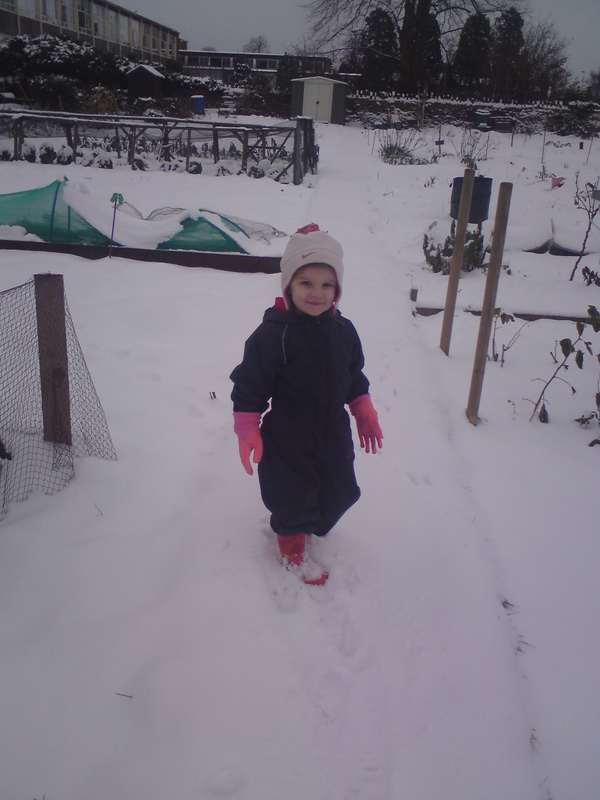 I couldn’t even find the parsnips beneath the foot of snow. A fork got stuck. The spade just hot the surface with a dull thud, sending painful shock waves into my frozen hands (even in gloves). Meanwhile, two-year-old Bonnie, the only one of my four children to ever volunteer to come to allotment, decided she’d had enough and started moaning. Well, whingeing. I’m trying to dig frozen leeks from ten inches of rock-solid soil while she’s making that not-quite crying noise. Then she hits me with the killer punch – “I need a wee” – while wearing an all-in-one show suit. I gave up on the veg. Took her back to the car where the emergency potty lives and went home. With just one frozen leek with a heavy, solid cube of frozen mud stuck to the bottom. Bloke laughed. THE last week of school saw my elder two a little jealous of their younger siblings, for a change. The primary/nursery Christmas celebrations are great – party food instead of school dinners, toy-days and visits to panto (the Deco’s Aladdin was brilliant, according to seven-year-old Bill). 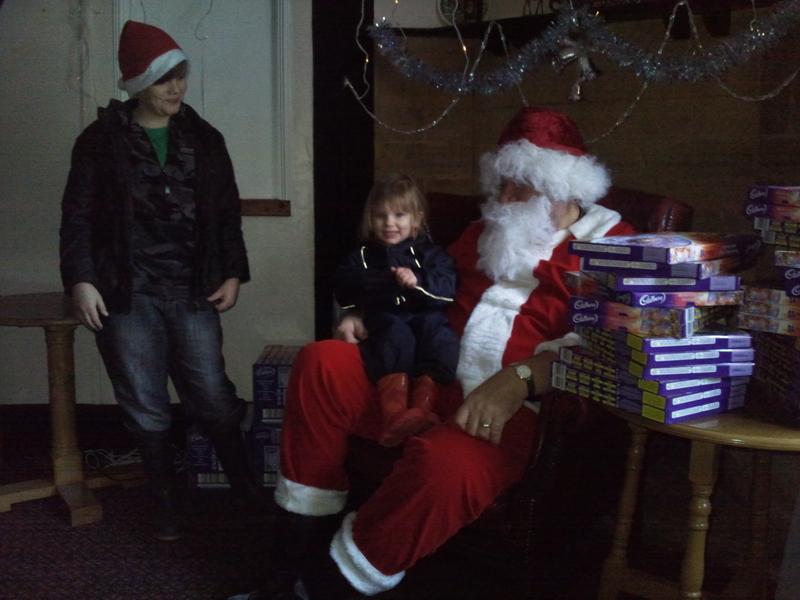 Two-year-old Bonnie has met Father Christmas several times this month, including at the aforementioned rugby club, where she jabbered away in the queue to anyone who’d listen: “I’m seeing Farver Kiss’mus!” As soon as she got in for an audience with the big man himself – silence. Completely mute. Refused to say a word. Bloke had to apologise for her manners as she took her selection box and toddled out. We all saw Father Christmas last week, but in an unexpected setting. A car was performing a dodgy three-point-turn at a junction and we had to wait for it to get out of the way. Imagine our surprise to see Father Christmas at the wheel, full suit, hat and beard, cursing away to himself. Well, I guess we all get a little stressed at this time of year . . .
WHAT with work, and poorly children and nativities, I still haven’t got around to Christmas. At least the Christmas tree is up. That’s a start. Cards still not written, presents still un-bought. The family photo-calendars I have to dutifully upload and buy every year in quadruplet aren’t sorted. And there’s less than ten days to go. Bonnie can’t resist the tree (fake). She’s two, therefore bewitched by anything sparkly. She did help hang some baubles but now knows she can’t touch. The temptation is overwhelming, bless her. 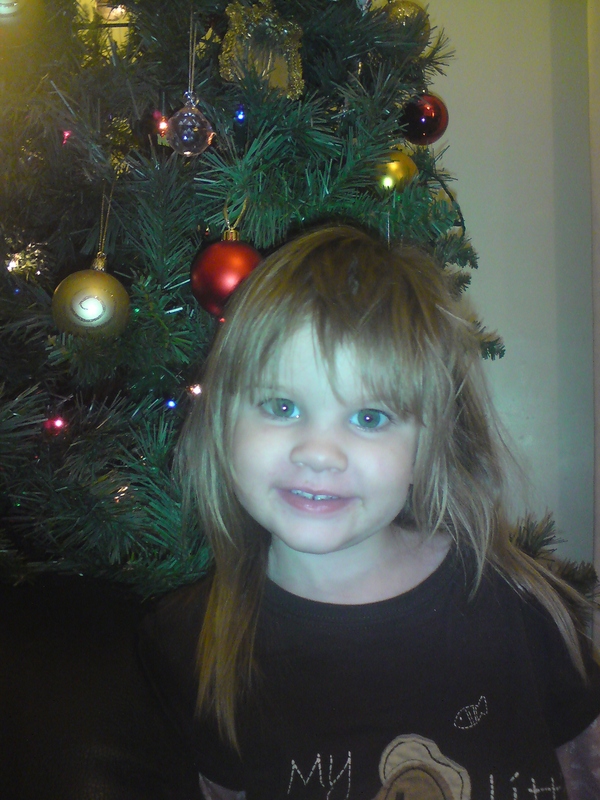 She’s a little confused and very over-excited by Christmas. “It’s my birthday?” she asks, hopefully, on a daily basis, only to be told no. She knows there’s presents, parties and decorations involved, but hasn’t a clue where this Jesus Baby comes into things. Still, I think we’re safe until the Peppa Pig advert calendar runs out. Then we’ve got some explaining to do. 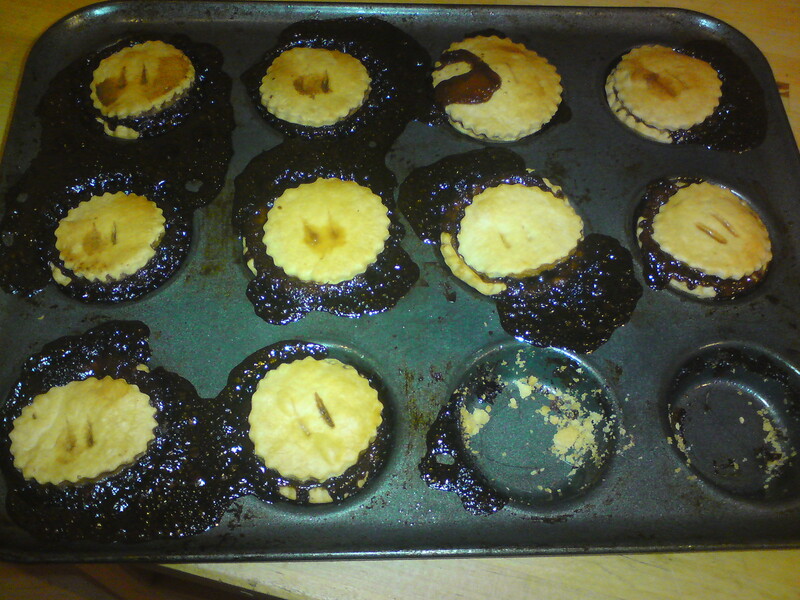 . .
Last year I made my first ever mince pies. From scratch. 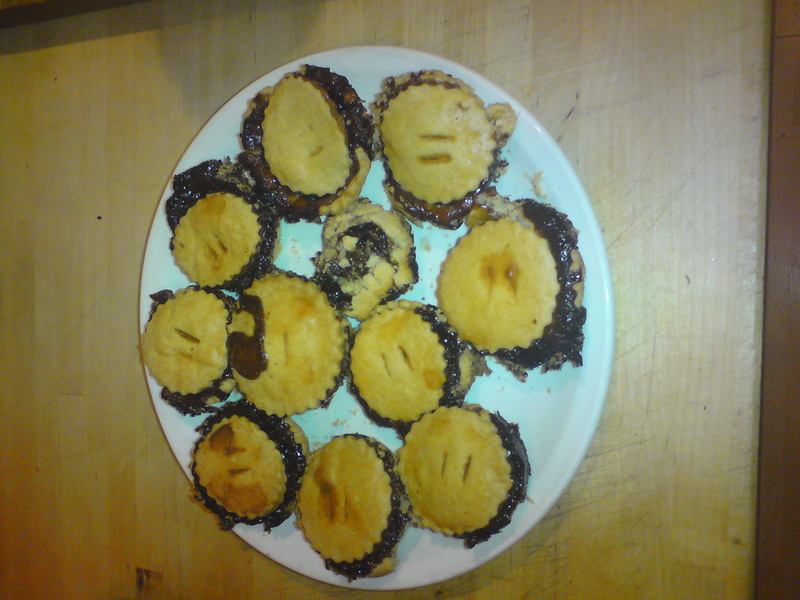 Own pastry, own filling (and I don’t even really like mince pies). Here’s this year’s effort: home made pastry, and far too much Robinsons’ filling, too long in the oven.